The Warriors have now qualified for a place in Cup Semi-Finals which will be played on Sunday (Apr 14). The Warriors played two matches on Friday as they beat Yaraleen Lions from Australia by 11 runs and following an hour’s rain delay also defeated House of Cricket from South Africa by six wickets. Warriors have a formidable top three as Assad, Imal and Hadi all made runs over the course of two matches. Each of the top six sides after Round One play a further two matches in the second stage, with their points tallies carried forward to formulate the groupings for honours on Sunday. Other sides currently occupying the Cup places after Day 3 were the boys from Bangladesh Heritage Cricketer made it five wins out of five to stand in second place in the table after beating Leederville from Australia by four wickets. Although they both lost on Friday, Yaraleen and Leederville are still in the top four. 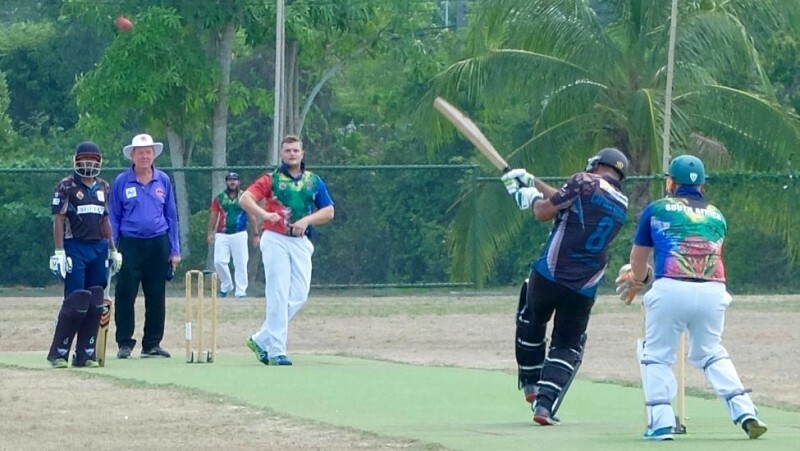 Leederville lost both matches on Friday as they had earlier been beaten by local favourites Patong and House of Cricket will overtake them if they beat Yaraleen on Sunday morning. Patong have to face Heritage so they are still most likely to compete for the Bowl rather than reach the Cup semi-finals. The Plate group competed for by the sides finishing in places 7 to 10 after the first round, saw its opening salvos. Friday’s matches saw wins for Eagles and Southern Stars who both gained their first victories of the tournament but Bounty Buccaneers won the final Sixes match of the day to leave all four teams including CBBs in contention for the Plate final. Following the completion of seven matches in the Sixes, a 15-over matches was played between the All Stars and the Rest of the World as the 22 players who were put forward to play were selected for the two sides by drawing names out of a hat. The random selection process worked perfectly as teammates played against teammates with a large selection from House of Cricket being roared on by their enthusiastic supporters. Both teams collapsed early against hostile bowling but All Stars recovered to 103 for 8 thanks to 35 from Assad Bora, but it was Rest of the World who won by two wickets after Faisal Ahmed hit 31 before his retirement before last man Amiruddin hit two sixes to win an exciting match. Today (Apr 13) sees a rest day from the main competition as participants enjoy the Songkran celebrations along with some Beach Cricket at Bang Tao. Finals Day tomorrow will see the honours decided from 9:45 at the Alan Cooke Ground. After the conclusion of the group matches there will be semi-finals and a final in the Cup and finals for the Bowl and the Plate. Admission is free for spectators, all are welcome and refreshments are available.